Kitty cats it is not everyday that one falls in love with a handbag in such a way that they contemplate dipping into their life savings and tossing it directly in the face of the shopkeeper in order to claim perfection as their very own; nevertheless, it is an occurrence that does happen every once in awhile during the course of an individual’s lifetime, leading the consumer in question to cast all cares to the wayside and splurge, splurge, splurge! In past times, such an honor fell upon Balenciaga’s Giant City and Marc by Marc Jacobs’ Stam Satchel; now, the object being swooned over has fallen upon the shoulders of the bewitching Large Leather PS1 from Proenza Schouler. Darlings if there is any doubt in your mind regarding the necessity of a wondrously weatherbeaten messenger bag slash satchel to one’s wardrobe please shut it out immediately! The truth of the matter, I’ll have you know, is that a cross body bag is an item which no supposed fashionista should be without. It retains the ability to allow for free hands during spur of the moment shopping sprees; whilst adding a splash of casual finesse to the haut monde ensemble we both know you are currently accoutered in. All of which can be observed with one half-second glance in the direction of the Large Leather PS1. Half inspired by the uniform-wearing Prep School students nonchalantly strolling along Park Avenue, ties undone and hair mesmerizingly mussed; half influenced by the saddle bags carried by experienced equestrians, the Large Leather PS1 combines two worlds into one charming carryall, allowing the user to look unfussy yet fabulous. If only the pricetag were as magnificent as the alluring aesthetic. Obviously there is no doubt that Proenza Schouler’s pretty is jaw-droppingly beautiful; but at $1,995.00, it is also fairly unattainable for the frugal fashionista. 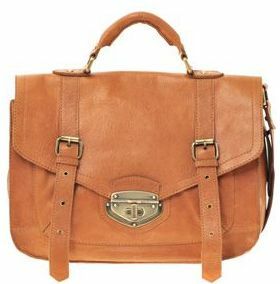 ASOS’ Leather Twist Lock Satchel, on the other hand, is more wallet-friendly. While slightly darker in color than its more expensive pal; for $109.91, the ASOS piece is a classy compromise with the power to breathe a little elegance into any girl’s handbag collection! Tell me, kittens…will you be a big spender and go for Proenza Schouler, or be thrifty and spring for ASOS? Thanks to Barneys and ASOS for the pictures. i actually really like the color of the asos more. i would go with the asos one! I absolutely love the real thing but I certainly can't afford it! The knock off version is pretty damn good and the price brings me relief! You have great taste lady!!! So tempted to use birthday money (if I get any) on the asos one! Oooh I love them both, but the color of that first one... gorgeous. I always find I like the more expensive item a little bit better...i think it's the details, but maybe it's all subconscious? I have no idea. You really are great at finding these Lust-Must items! This would be a great work tote for me! Ooh, I actually love the cheaper one a heck of a lot more! Sweet! Oh my god. That's the most beautiful bag I have ever seen. Or maybe I'm just excited to not be staring at a textbook for once lol. The Proenza Schouler is calling my name. I've been in love with that bag for quite some time now, but the price of the ASOS bag is much more reasonable. *sigh* What to do? I actually like the 2nd one better. The fact it's cheaper makes it three times better. i'm drooling over this bag. i'm gonna go check it out on asos right now! i'm so tempted...i have to resist and stick to my shopping ban!!! I love them.. I wish to buy them too. The ASOS is still a bit high for me but I would probably go for that one. I have been romper and bag obsessed all week. ASOS all the way! I love it! Either one, I know my life wont be lost in one mass hobo bag. This would help me so organized. I'm officially obsessed with this bag right now. Completely. Love your Asos find! love it! I prefer the color of the ASOS one! You definitely wouldn't feel like a messenger in any of these. Yummy! You'd definitely feel you'd have a destination in mind with these to carry. I'd love the real deal..but I like the other choices just as much. omg love it!! totally the perfect color for me LOL. I'm all about nudes and beige!! YAY!!! Hope you are having a nice week Erika! Lovely find, as usual, darling! The ASOS bag looks JUST as great as the PS one! is it just me, or does the ps1 and alexa mulberry bag look tooooo similiar. dont get me wrong, love them both.. 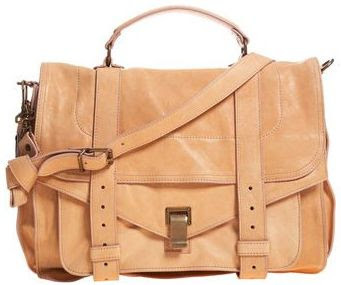 I absolutely love the Proenza Schouler one :) I even like the color of that more too haha. Whew that's alot of money!!! That's like a class in my college tutition!! Yikes! The cheaper one looks just as nice. Seriously!! Great one!! i'd be thifty - i actually think the asos one looks nicer, both the darker colour and the slightly rounder shape of it.. I love these handbags, they are gorgeous. I think the ASOS option is a tremendous value for the money! I'll definitely opt for the ASOS. I actually prefer the whole look of it better than the first one, particularly the darker shade. That is a fabulous steal you have found there in the ASOS bag. If I'm ever to spend more than a thousand bucks for a bag, it better had be the Balenciaga! I like the ASOS one better- the color is so nice!! You found an incredible substitute - thank you! I really don't need a new bag, but this is such a temptation. Oh, I like them both! I've been wanting a PS1 but the bag from ASOS is more in my price range. I love Proenza. It's one of my favorite labels. And I definately think this is a useful (and beautiful!) style of bag. But I agree that is wayyyy out of my budget. I think I would try to thrift one. and the bag u r reviewed is so lovely.. I love the way you wrote this and I have sometimes dipped into my life savings for fashion must have items. I love the style and colour of these bags and they look so sophisticated. Oh, my cartoon character, Cassandra Carmen, has this bag -- how I wish I could raid her closet!! I'm so excited you featured it, I just love it! Unspoilt elegance, ease and cool and in one handbag! i seriously LOVE the both of them! It's such a beautiful bag. I am definitely going to go for the more expensive version today! I think you are my frugalista sister! I am in love with ASOS and just bought 3 things from them in the last 2 weeks. I check their site DAILY...Sigh, another fashion obsession, lol! That bag is soooo beautiful! In my fantasy world, I already own the PS bag. In the real world, the ASOS bag would fit quite nicely into my wardrobe and budget...ASOS it is! I just adore the second one!